Schools around the nation often enlist the help of police officers with the intention of keeping their students safe. These police officers, or School Resource Officers (SROs), are supposed to prevent crime on campuses and are responsible for the health and safety of all students. The actual outcome of having these SROs on campuses, however, does not increase student safety at all. More police on campuses has only increased the number of suspensions and arrests in schools, primarily affecting students of color. 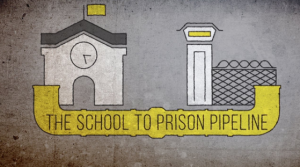 Instead of protecting students, having SROs only further criminalizes youth of color and reinforces the school-to-prison pipeline. Throughout the United States, and specifically in areas of New York City, organizations have started to directly address the problems that SROs are causing. There is a push for an implementation of restorative justice practices (which involve the students in the solution and emphasize rehabilitation) as an alternative to suspensions, expulsions, and arrests. There is also a strong move towards better training for SROs to include student psychology and development, cultural respect, student rights, and alternatives to excessive force. Zero-tolerance discipline has resulted in Black students facing disproportionately harsher punishments than white students in public schools. Black students represent 31% of school-related arrests. Black students are suspended and expelled 3x more than white students. Students suspended or expelled for discretionary violation are nearly three times more likely to be in contact with the juvenile justice system the following year.